Chip In to get C4SS and Markets Not Capitalism to Libertopia! Libertopia is an annual convention / festival for voluntaryists, market anarchists, and other people seeking liberty and peace through radical means, outside of electoral politics. It’s held every year in San Diego; the 2012 convention is coming up next weekend, from October 11 to October 14. We’re happy to note that this year there will be a veritable mob of left-libertarians, free-market anti-capitalists, C4SSers, and other lefty-friendly commentators who have been invited to speak throughout the event — including a number of panel discussions, breakout sessions, and tabling with literature and one-on-one conversations. 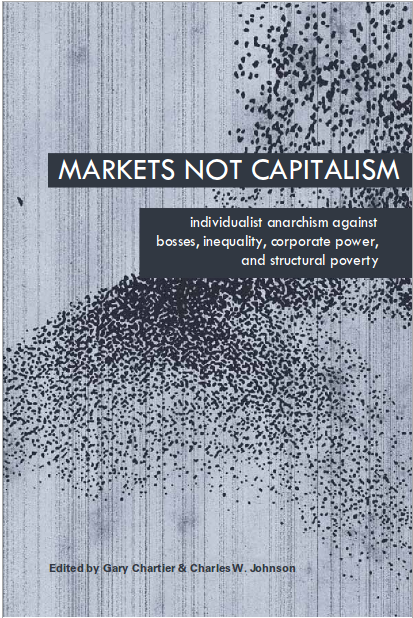 There’ll be a panel on Markets Not Capitalism featuring editors Charles Johnson and Gary Chartier, and contributors Roderick Long and Sheldon Richman. There’ll be breakout sessions by Charles Johnson and Roderick long for the Molinari Institute, on Race, Gender and Anarchy, and Ask an Anti-capitalist! A Freewheeling Q&A on Markets Not Capitalism, Left-Libertarianism, and Mutualist Ends Through Free-Market Means (The latter has been scheduled to be held Sunday morning in the John Galt Room, which I will just have to chalk up to one of the more hilarious examples of culture clash I’ve encountered since I got into the left-libertarian gig.) And also look for intriguing talks from C4SSers like Gary Chartier, Sheldon Richman, Stephanie Murphy, as well as presentations by Angela Keaon, Sharon Presley, and Anthony Gregory. You can see the full schedule online. If you want to help out, and to support left-libertarian outreach, engagement and scholarship, you can toss a few coins in the hat using the ChipIn widget above. We’re hoping to spread out the costs with a lot of small donations, and anything you can give towards the fundraising goal would be really helpful, and definitely appreciated. 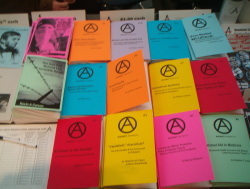 (Donations go to the Molinari Institute, and proceeds above the reimburseable travel and registration expenses, in the event there were any, would then go towards supporting the Molinari Institute’s production and distribution of market anarchist literature.) If you believe, as we do, in bringing out an uncompromising left-libertarian, individualist anarchism, please click through and contribute today. Thanks! Hope to see y’ALL in California!